Your animal companion’s well-being is a top priority at Triple Dog Pet Therapies. Through focused techniques, massage and acupressure can help with overall health — improve circulation, range of motion, digestion –but it can also benefit specific issues — swelling, muscle tension, anxiety. 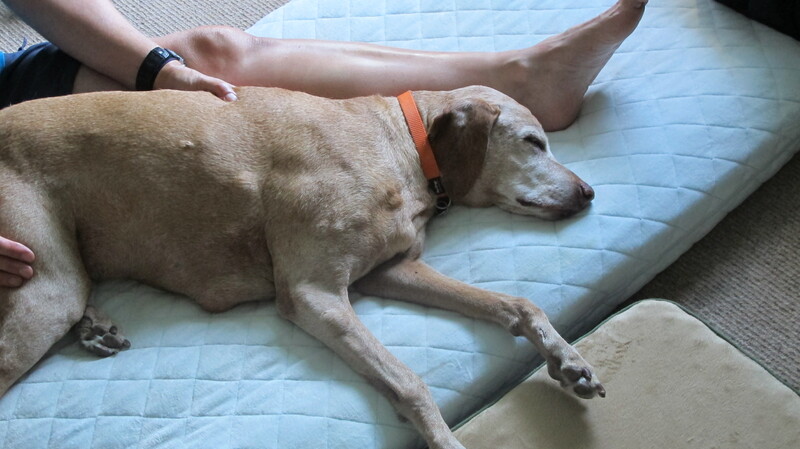 Whether your pet is elderly and suffering from arthritis or recovering from surgery or injury, massage and acupressure therapy can support the healing process, reduce the chances of further injury, and improve your companion’s day-to-day life. Please visit out Understanding Acupressure and What to Expect pages to understand more about the work and its benefits. At Triple Dog Pet Therapies we offer both in-your-home session as well as sessions through Aqua Dog Spa (in Kent) and Splash Dog Spa (in Edmonds). The first session is an hour in length. This allows for a full assessment and intake/history that will determine the frequency of future sessions. RCW 18.240.010 Certified animal massage practitioner” means an individual who provides external manipulation or pressure of soft tissues by use of the hands, body, or device designed and limited to providing massage. Animal massage may include techniques such as stroking, percussions, compressions, friction, Swedish gymnastics or movements, gliding, kneading, range of motion or stretching, and fascial or connective tissue stretching, with or without the aid of superficial heat, cold, water, lubricants, or salts. Animal massage does not include: Diagnosis, prognosis, or all treatment of diseases, deformities, defects, wounds, or injuries of animals; attempts to adjust or manipulate any articulations of the animal’s body or spine or mobilization of these articulations by the use of a thrusting force; acupuncture involving the use of needles; or mechanical therapies that are restricted to the field of veterinary medicine. Animal massage may be performed solely for purposes of patient well-being.